Sarah Nader - snader@shawmedia.com Josh Brent, 15, of Crystal Lake gets his head shaved on Friday at Crystal Lake South High School to raise money for the St. Baldrick's Foundation on March 16, 2012. Brent had a brain tumor in 2005. He's going better, but still has to under go regular blood tests. 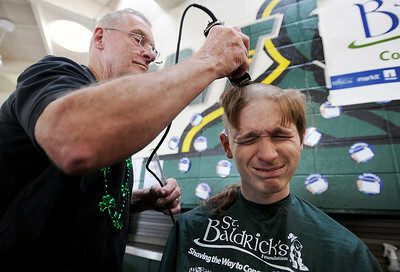 Sarah Nader - snader@shawmedia.com Josh Brent, 15, of Crystal Lake gets his head shaved by volunteer Tony May (left) of Crystal Lake at Crystal Lake South High School to raise money for the St. Baldrick's Foundation on Friday, March 16, 2012. Brent had a brain tumor in 2005. He's going better, but still has to under go regular blood tests. Sarah Nader - snader@shawmedia.com Hair covers the ground after volunteer had their head shaved on Friday at Crystal Lake South High School on March 16, 2012. 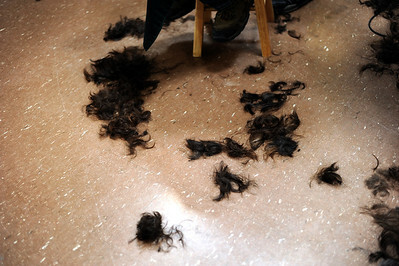 Participants shaved their heads to raise money for the St. Baldrick's Foundation. The foundation is a volunteer-driven charity that provides funding to find cures for childhood cancers. 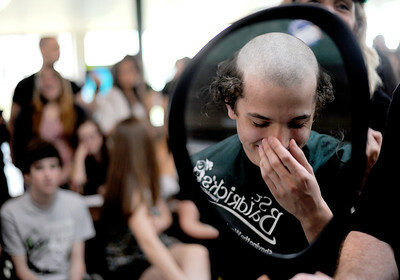 Sarah Nader - snader@shawmedia.com Ryan Olson, 16, of Crystal Lake laughs at his hair while getting his head shaved on Friday at Crystal Lake South High School on March 16, 2012. Participants shaved their heads to raise money for the St. Baldrick's Foundation. The foundation is a volunteer-driven charity that provides funding to find cures for childhood cancers. 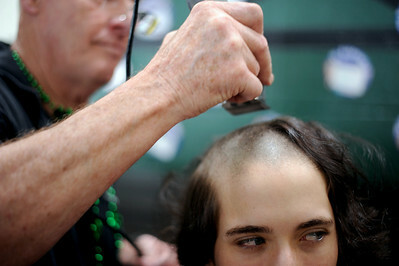 Sarah Nader - snader@shawmedia.com Dillon O'Neill, 16, of Lake in the Hills gets his head shaved on Friday at Crystal Lake South High School on March 16, 2012. 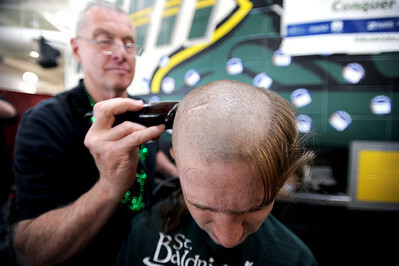 Participants shaved their heads to raise money for the St. Baldrick's Foundation. The foundation is a volunteer-driven charity that provides funding to find cures for childhood cancers. Josh Brent, 15, of Crystal Lake gets his head shaved on Friday at Crystal Lake South High School to raise money for the St. Baldrick's Foundation on March 16, 2012. Brent had a brain tumor in 2005. He's going better, but still has to under go regular blood tests.